We recently completed a mine plan for a sand deposit intended for mining by suction-cutter dredge. Laying out a mine plan for a dredge operation is a straight forward task, but estimating reserves is a bit more complex. In fact, reserve estimates for dredge operations may be more art than science. We have experience performing mineral appraisals for dredge sites, so we are not like “fish out of water” when it comes to these matters. Reserve estimates always begin with understanding the mineral resource, modeling the resource to the highest level of confidence possible, and then applying the Modifying Factors to convert the Resource to Reserves. For a detailed explanation, refer to the 2017 SME Guide for Reporting Exploration Results, Mineral Resources, and Mineral Reserves. What is a reasonable recovery rate for dredge pits? This is the number one question any mine planner that designs a dredge layout is trying to answer. Dredge manufacturers we spoke to were reluctant to cite any recovery rate without first fully examining all of the data, and rightly so. And a literature review yielded little information concerning resource recovery, though we found some useful information through the Western Dredging Association, a non-profit technical organization that focuses on all matters related to dredging. Our first step was to phone our friends. So, we called “Joe.” “Hey Joe, what are you guys estimating for dredge recovery at your site?” “We’re probably getting 80%,” he says. “Are you guys measuring that, or is it just a guesstimate?” we asked. “Nah, it’s a measurement based on the material coming into the plant and the plant yield,” says Joe. “Oh, so what sort of recovery are you getting in the pit then?” At this point, Joe did not know for certain because they did not do any reconciliation between the resource model and what had actually been dredged. There are two recovery rates to look at for dredge operations. Dredge recovery in the pit. Plant recovery of material received from the dredge discharge pipe. In practice, all reserve estimates consider recovery “in the mine” and then recovery during mineral processing, so dredge operations are not unique in this regard. The resource recovery from the pit is a function of several factors, and not all are covered here. How much variation is there in the bottom of the deposit? Most of the sand deposits we have evaluated through the years have a heavy clay layer at the base, at which point the resource bottoms out. Dredges prefer to lower their suction-cutter heads, or ladders, to a fixed depth and mine to a flat bottom, and with today’s advanced sonar equipment, a good dredge operator can maintain a flat bottom to their pond. However, if the deposit’s bottom varies in elevation, how does a dredge operator ensure they get all of the sand resource? Some of our friends tell us that a dredge operator can feel the cutter head slow when it encounters the clay, but by this point clay balls are already headed to the plant. Any operator, faced with a choice of delivering high production or maximizing resource recovery, will always choose high production. 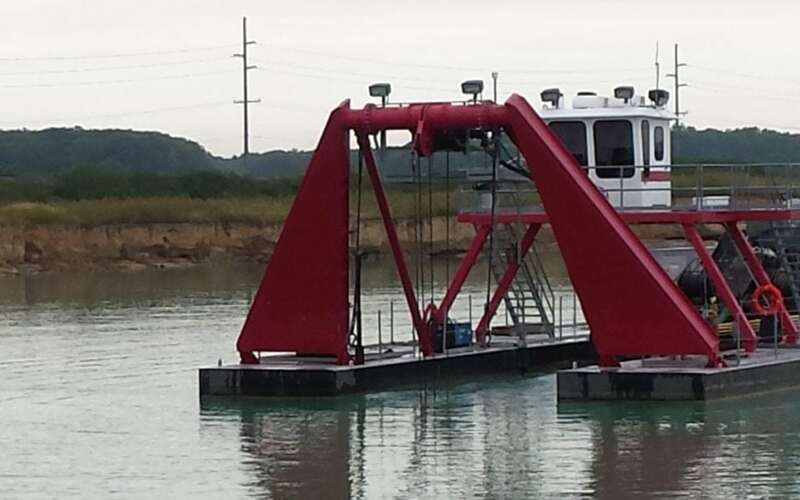 How much is technology used on the dredge? Some operations perform periodic bathymetric surveys to produce a digital terrain model whereby the actual excavation may be compared to the predicted resource model. From our friends that practice this, we learned that in-pit dredge recovery of the resource may be around 75%. Bear in mind that these pits are using available technology to maximize overall efficiency of their dredge operation, and not every operator has made the investment in technology. DREDGEPACK(R) is one of many packages available today to aid the operator in maximizing dredge efficiency. For our work, we selected a 70% recovery, by volume, of the in-situ resource. The conservative selection helps ensure that there are sufficient reserves to support the capital investments and any supply contracts the operator may negotiate. Also remember that the resource only includes those areas that have reasonable prospects for eventual economic extraction. Areas on the subject property that are not mineable cannot be considered a resource. Sand plants are generally unique to every operation. Aggregates operations producing ASTM C-33 concrete aggregates and other fine aggregates for construction will have a series of sand screws, classifying tanks, and screens. Frac sand operations will add attrition mills and dryers to the process. From a mine planning perspective, we are interested in the recovery of saleable material from the run of mine ore that comes from the pit; in the case of the suction-cutter dredge, what can be recovered from the material in the discharge pipe? Characterizing sand gradations requires core drilling, and there are a few different methods for obtaining core from sand deposits, each with pros and cons. We won’t cover those methods here, but core drilling produces samples for sieve analysis, and the specific test methods will vary according the desired end use for the sand. Performed correctly, these test results can be incorporated into geologic models, preferably block models estimated by use of appropriate geostatistics. The mine planner can then estimate what may reasonably be expected to be delivered to the plant through the dredge discharge pipe, and a plant recovery may be applied to that volume. From our work, site specific testing indicated that 10% of the material, by weight, would be discarded as fine tailings. So, we determined that a 70% recovery, by volume, could be realized in the pit, and a 90% recovery, by weight, could be realized in the plant. So, given 1,000 cubic yards (yd3 ) of undisturbed sand at 120 pounds per cubic foot (pcf), or 1.62 short tons per yd3 (st/yd3), we can expect to recover 70% of this, or 1,134 st. Of the material recovered from the pit, 90%, by weight, or 1,021 st, can be sold as various products. Yeah, we didn’t have to convert volume to mass in this case, but it’s important to understand the basis for recovery at each step. The total dredged resource recovery is calculated to be 63%; much lower than the 80% many of our friends initially quoted. In fact, during prior engagements where we reconciled sales of sand & gravel against acreage mined, we estimated as low as 49% total resource recovery from dredging. Note that our resource volumes are based on what has a reasonable potential for recovery, and thus considers the slopes at the banks as well as the slopes underwater. We use Carlson Software for modeling our pit shells. So, for those estimating from a simple boundary line and calculating area, thickness, and volumes, the recovery should be lower than the 63% we calculated here. No Reserve estimate is complete without an economic analysis. Most dredge manufacturers are able to provide assistance for performing this critical task. Groff Engineering & Consulting LLC has also performed economic analyses in its mine planning services. Contact us today to help with your next project!